Physicist (atomic physics). On the physics faculty at University of Pittsburgh, 1926-1944; on faculty of Case Institute of Technology: dean of faculty, 1944-1950, dean of the Graduate School and director of Research Division, 1952-1957; director of the American Institute of Physics, 1957-1964. December 29, 1902Birth, Cleveland (Ohio). 1923B.S. in Physics, Case School of Applied Science, Cleveland (Ohio). 1923 – 1924M.S. in Physics, Massachusetts Institute of Technology (MIT), Cambridge (Mass.). 1924 – 1926Assistant in Physics, University of Minnesota, Minneapolis (Minn.). 1926Ph.D. in Theoretical Physics, University of Minnesota, Minneapolis (Minn.). 1926 – 1944Instructor (1926), Assistant Professor (1927-1936), Professor in Physics and Head of Department of Physics (1937-1944), University of Pittsburgh. On leave 1929, 1936-1937 and 1941-1944, Pittsburgh (Pa.). 1929 – 1930Studied under Erwin Schrödinger, University of Berlin. 1936 – 1937Assistant Director, American Institute of Physics (AIP). 1937 – 1953Founding Editor, Journal of Applied Physics. 1941 – 1944Chief Technical Aide, Division 6 (Undersea Warfare), National Defense Research Committee, Office of Scientific Research and Development, New York (N.Y.). 1944Awarded the Presidential Certificate of Merit for War Research. 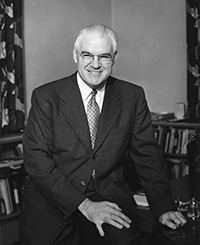 1944 – 1957Dean of Faculty (1944-1955), Acting President (1950-1952), Dean of the Graduate School (1955-1957) and Director of the Research Division (1955-1957), Case Institute of Technology, Cleveland (Ohio). 1947 – 1957Member, Advisory Committee on Industrial Information, Atomic Energy Commission. 1947 – 1957Member, Subcommittee on Unclassified Reactors, National Research Council (NRC). 1948 – 1953Chairman, Board of Editors, American Institute of Physics (AIP). 1950 – 1957Member, Publication Commission, International Union of Pure and Applied Physics (IUPAP). 1950 – 1959Chairman, Committee on Science Abstracts of the American Physical Society (APS) and American Institute of Physics (AIP). 1951Awarded gold Outstanding Achievement Medal, University of Minnesota. 1953 – 1965Vice-Chairman, Abstracting Board, International Council of Scientific Meetings. 1955 – 1957Chairman, Committee on the Role of Physics in Engineering Education, American Institute of Physics (AIP). 1955 – 1957Chairman, Advisory Committee on Russian Translations, American Institute of Physics (AIP). 1956Awarded Meritorious Service Award, Case Alumni Association. 1957Member, Governing Board, American Institute of Physics (AIP). 1957Awarded Distinguished Service Citation, American Association of Physics Teachers (AAPT). 1957Honorary D. Sc., Case Institute of Technology, Cleveland (Ohio). 1957 – 1964Director, American Institute of Physics (AIP). Hutchisson was the driving force to establish the Education Division, the Center for the History of Physics, and the Niels Bohr Library & Archives, New York (N.Y.). 1958Honorary D. Sc., Washington College (Chestertown, MD). 1958 – 1963Member, U.S. National Commission for United Nations Educational, Scientific and Cultural Organization (UNESCO). 1958 – 1963Member, Board of Directors, The Foundation for Instrumentation Education and Research Incorporated. 1958 – 1963Member, Scientific Information Council, National Science Foundation (NSF). 1960 – 1963Trustee, Engineering Index, Inc.
1960 – 1963Chairman, Advisory Committee on Documentation, National Academy of Sciences - National Research Council (NAS-NRC). 1962 – 1964Member, Committee on International Education in Physics, American Association of Physics Teachers (AAPT). 1965 – 1983Director Emeritus, American Institute of Physics (AIP). 1977Awarded gold medal, Case Alumni Association. From the Oral History Interview with Elmer Hutchisson, American Institute of Physics. Wife, married September 14, 1925. Co-wrote the textbook "Outline of Atomic Physics" and "A Manual for Experimental Physics." Both employed at the University of Pittsburgh. M.S. advisor at Massachusetts Institute of Technology (MIT). Co-wrote a number of articles. Co-wrote the textbook "Outline of Atomic Physics." Advisor at University of Berlin. Collaborated on undergraduate thesis at Case Institute of Technology. Ph.D. advisor at University of Minnesota. Both employed at the American Institute of Physics (AIP). Both employed for Division 6 of the Office of Scientific Research and Development. Both employed at the University of Minnesota. Both employed at Division 6 of the Office of Scientific Research and Development. Both employed at Division 6 of the Office of Scientific Research and Development and at the American Institute of Physics (AIP). Both employed at the University of Minnesota and for Division 6 of the Office of Scientific Research and Development. Both employed at the University of Pittsburgh. Lived together at the University of Minnesota. Obtained B.S. in physics in 1923. Dean of Faculty, Acting President, Dean of the Graduate School, and Director of the Research Division. Instructor; Assistant Professor; Professor in Physics; and Head, Department of Physics. Member, Committee on International Education in Physics. Chairman, Committee on Science Abstracts. Obtained M.S. in physics in 1924. Chairman, Advisory Committee on Documentation. Member, Subcommittee on Unclassified Reactors. Member, Advisory Committee on Industrial Information. Member, U.S. National Commission for United Nations Educational. Obtained Ph.D. in Theoretical Physics in 1926. AIP Office of the Director records of Elmer Hutchisson, 1948-1966, (bulk 1957-1964). An outline of atomic physics manuscript, 1954. AIP Office of the Director records of Van Zandt Williams, 1964-1966.